Didn’t Neil Warnock do well, eh? What a delight it will be to see him back in the top flight next season. Without giving Colin a second thought, Jamesy and I did a podcast last week (you can find it below) on 5 things you might want to do after winning a promotion. 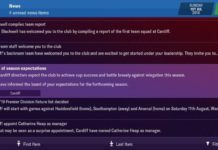 James has won promotion to League Two with his Boreham Wood side but as I cannot hack into his computer and steal his screenshots, I’ll walk you through what we discussed using my new save with, er, Kuala Lumpur in Malaysia. And, thank the universe, we won promotion from the second tier in our first season – not that it was ever really in doubt. No, do understand this dear reader(s). This is not a definitive guide. These are merely suggestions from two everyday FM players using things they’ve learned along the way. Hell, they might not even be right. There’s no point getting promoted if you are going to go straight back down again is there? Especially if you are in Malaysia where you don’t exactly get access to the levels of cash available in the English top flight when you finally get there. So it would make sense to get some kind of idea as to whether your squad is up to scratch for the next level. Typically, I personally work on the assumption that if you were not good enough to get into my team when we were in the division below you are unlikely to be good enough in the next division up (academy players are exempt from this sweeping statement) so I always have a look at who failed to impress me in the promotion season and make some decisions about them. 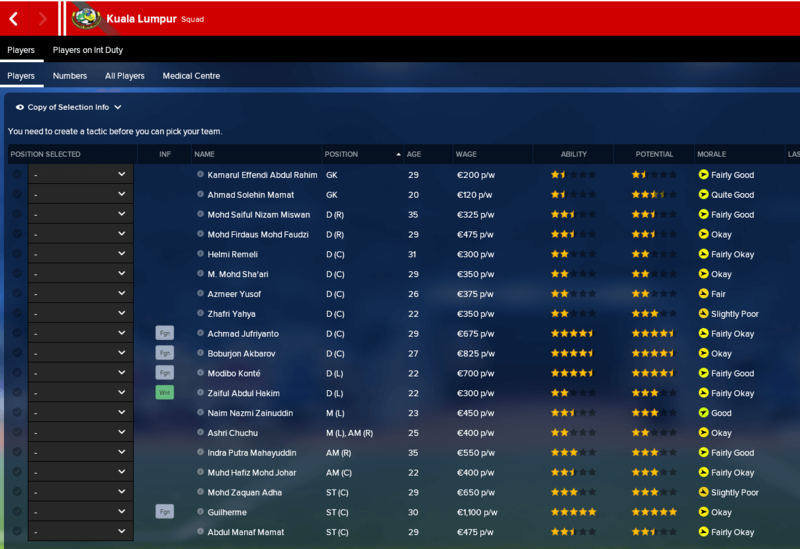 Some I will still keep, especially if there is nobody in the Academy able to take their place or a transfer target that I can bring in but in the main, they will all be moved on over the close season. Another idea that came up was to have a look at the division above and check out the players and teams. 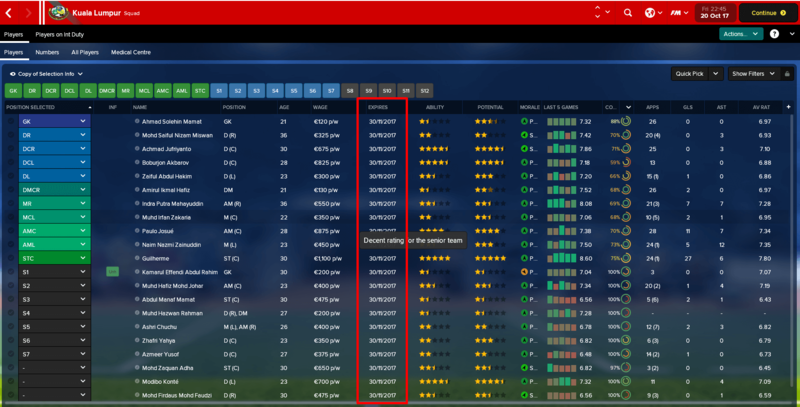 Looking at some performance stats, tactics and even player attributes will help you get a feel for whether your squad is going to be able to compete. I love doing this. If you are completely honest, you have a good idea as to whether you are going up or not before the confetti finally falls down around your ears. And, if you are in that position, you are foolish not to have started your planning early. As it was looking likely that Kuala were going up quite early on, I started drawing up a shortlist of players I would like around the halfway point in the league. 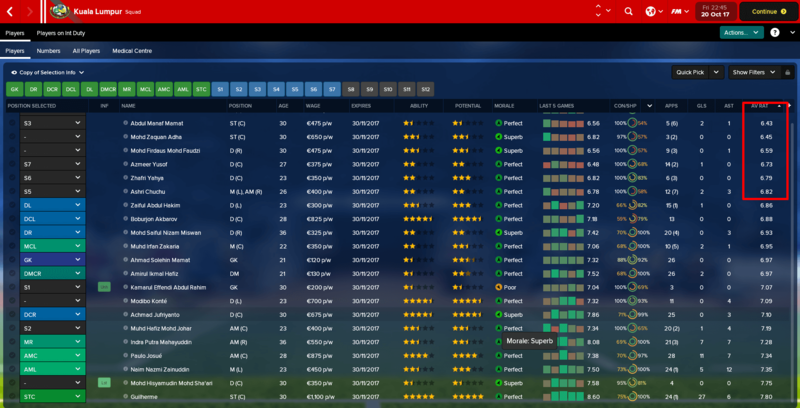 I looked at my squad and considered where we were weak, where I might not be able to retain because they’d want to move on or the offer I get might be too good to turn down and also players that I’d just have to sign if they were available to me. I ended up with a shortlist that looks like this. I won’t be able to get all of them and I don’t want all of them – but depending on how things pan out over the close season I have a rough idea of where I will be shopping. Are you going to be able to play the same way in the next division up? Personally, it is always a resounding yes as I hate changing a tactical approach once I have found something that is good enough to get me promoted. I prefer to recruit well to fit that style. But, everyone is different. You might want to tweak your approach depending on your squad, thoughts, analysis of the division you are going into. I just happen to think that if we’ve won a lot of games playing one way, it would be daft for me to change it and confuse everyone. 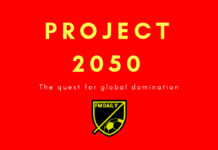 I like doing this – taking a look at the history of the division I am going up into and working out how many points I need to win it, get promoted again, qualify for continental competition, stay up, whatever. It gives me some targets to work to in the next season. As I may not have said, these are in no particular order. 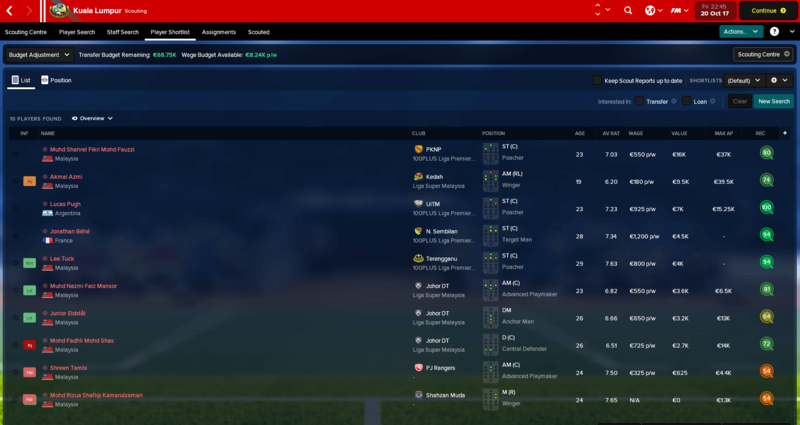 One thing you would be very wise to do is to sort out the contracts of players you want to keep! As you can see, all of my squad had their contract up which was a complete error on my behalf. Considering I knew we would be going up about halfway through the season, I should have spent time making sure our better players were locked down. And, as a result, I found myself in this position. Guillherme, all 25 goals of him, doesn’t want to stick around. There is every chance if I’d offered him a deal four months earlier he’d have happily said yes. And the one position I hate replacing is that of a proven goalscorer as you never really know if you are going to find someone as good. Fingers crossed that the Malaysian hitman I signed will do the business next season. 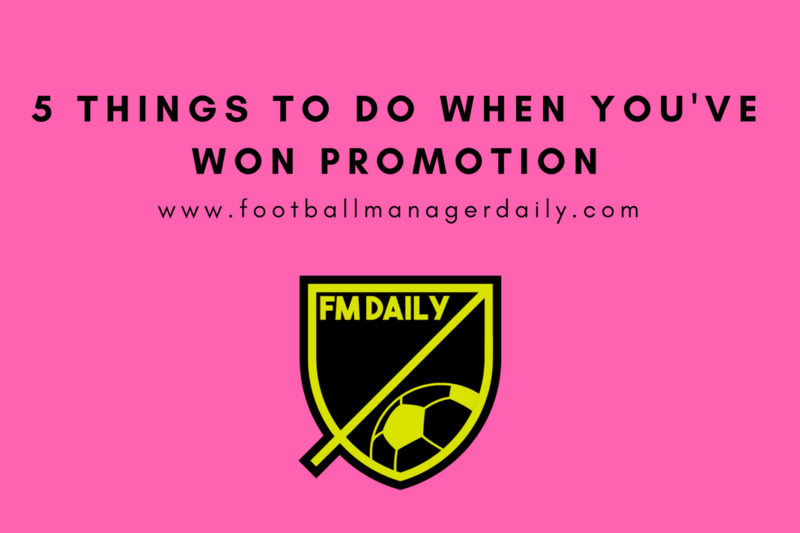 As I said, this is not a definitive guide to what you must do after winning promotion, just some ideas James and I threw around on the Regista FM Podcast recorded last week. 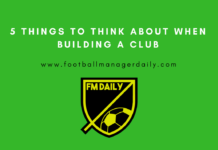 Let us know on @FMDaily_ if there is anything you like to do that we haven’t mentioned! Previous articleWonderkids 2009: Where Are They Now?